As Jews sit down for their Seders this month, we will once again be reminded of the great divisions that separate us as a people. Family gatherings can always make for tension, but it can be particularly ticklish in this era, where political arguments have split the nation. Our bifurcated society is one in which we read, listen and watch different media, and seem to have lost our ability to listen to each and our opposing views. Clashes over politics and religion make it hard for us to break unleavened bread — or any other kind, for that matter — without further annoying or even enraging each other. Tolerance for opposing views remains at an all-time low in society, and that can make for some pretty awkward conversations when you’re put at a table with relatives you may not like or with whom you have profound disagreements on the great issues of the day. Yet if you want to know what really divides Jews attending Seders, it’s not liberals versus conservatives, Trump haters versus Trump supporters, discussions about Israeli settlements, BDS or even whether or not to use the traditional Haggadah or to substitute some other trendy politically correct version or one that caters to the kids. 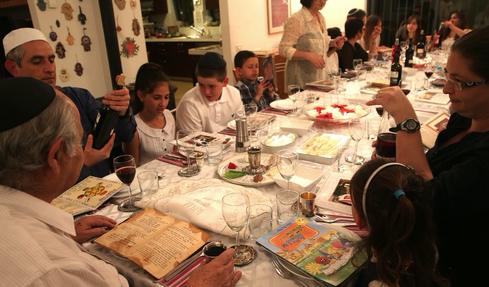 The real Jewish divide on Seder nights is between the talkers and the eaters. This schism transcends politics — or even whether or not your Seder is one in which every word of the Haggadah is read or sung aloud or if, like many non-observant families, your version of the ritual is abridged in some fashion. There are Jews who, as tradition dictates, wish to ponder every nuance of the Haggadah and parse each sentence for meaning, historical insight or religious inspiration. And there are the Jews who, following the dictates of another aspect of our tribal traditions, as well as the demands of their stomachs, just want to keep it moving along so as not to delay the meal. Passover is the greatest family education opportunity of the year. The problem is, a lot of the students think of the retelling of the story of the Exodus as a lengthy detour on their way to the food. Yes, I know, it’s possible, even normal, to be interested in discussing the Haggadah and the festive meal. But in a nation full of Jews who were for the most part not raised to care deeply for Jewish tradition, the impulse to avoid digressions, if not skipping some passages altogether, is irresistible. And when they’re sharing a table with people whose primary interest in the event is the discussion rather than the culinary delights, some conflict is simply inevitable. At such moments, we are reminded that, as with other weighty questions on which we may differ, tolerance (and a sense of humor) isn’t so much desirable as it is a sheer necessity. To those who are impatient with too much talk, I think it’s important to point out that at least once a year, it won’t kill you to take a moment to think about what it is that we’re doing. Reading the Haggadah is an exercise in atavism in which we, as tradition teaches us, attempt to not merely identify with slaves seeking freedom, but to think of ourselves as having experienced it ourselves. That is a powerful insight that goes to heart of our collective sense of peoplehood, as well as to our individual connection with Judaism. Yet the reading and the discussions are also a way to channel the Jewish tradition of study and learning. Most American Jews lack Jewish literacy and diving into this practice once a year isn’t easy, but if you give it a chance, it’s a worthwhile experience that shouldn’t be dismissed just because it delays the festive meal. At the same time, the talkers among us need to remember that learning only works with a receptive audience. Nobody likes to be lectured, especially by relatives. Pesach should be fun, and so should the discussions of the Haggadah. Don’t treat your relatives as if they are the wicked sons in the parable even if their impatience is annoying. Always remember that the mind cannot absorb more than an empty stomach can endure. Save the marathon learning sessions for when everyone present shares the desire to take deep dives into the meaning of every line. We all do well to remember that, as the Haggadah teaches, the more we discuss the Exodus, the more praise we deserve. But since even the Children of Israel complained in the face of miracles, don’t be too hard on those who just want to eat as soon as possible. I found it troubling that Mr. obin branded most of us American Jewish people as lacking Jewish literacy. I don’t know where the statistics are that prove that. I am especially troubled because it is like saying, as I have heard from Christians with a disdain for us “most Jews don’t go to synagogue after their Bar/Bat Mitzvahs” or “most B’Nai Mitzahs memorize their chants from rote, they don’t really know the Hebrew.” (I don’t “look Jewish so I hear all kinds of sweeping negatives about us). We need to be careful in what we say about ourselves to those looking on.